The Gander Flyers have been struggling on the ice but there is hope for this young organization in the Central West Newfoundland Senior Hockey League and this hope comes from their captain Ray Dalton. Dalton joined the Flyers this year after his stint with the EastLink CeeBee Stars and in doing so there is hope in the organization that he will provide the leadership to guide the team to great things. Dalton is no stranger to Newfoundland Senior Hockey. He has become a fixture around the league and is recognized as one of the best wingers around. Coming to the Flyers, Dalton has brought with him a positive and competitive attitude. He has indicated in several interviews that his goal is to see this organization achieve nothing less than a Herder championship. However, he is also a bit of a realist in acknowledging that the Flyers organization is a young organization with lots of great talent. He sees himself becoming a role model and a leader to help this young talent blossom into great players and in the process sees the Flyers becoming a threat as the season progresses. While the Flyers may be sitting in the basement right now, they have shown that they can not only compete in the league but they can also win. 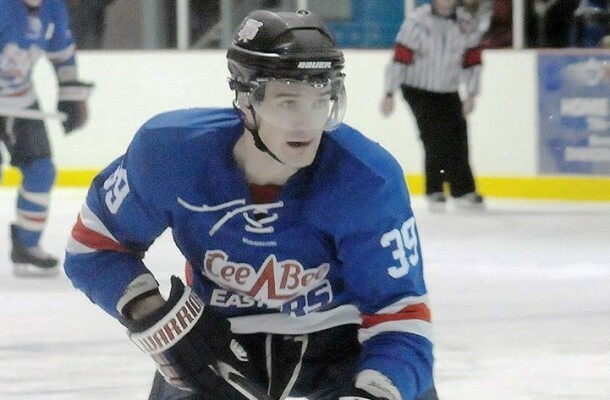 They upset the Grand Falls-Windsor Cataracts 5-2 in the Cats home opener and just this past weekend saw them rebound from a 9-2 trouncing at the hands of the Clarenville Caribous to lose the next night in a shoot-out. Dalton has been a key to the team’s performance, picking up 3 goals and 3 assists so far in this young season. Often paired with team scoring leader Jordan Escott, Dalton has continually put himself in a position to score and as the Flyers continue to play together and gel, you can sense that Dalton will be at the center of all the action on and off the ice. The Gander Flyers are definitely a better team with Dalton in the lineup and if his work ethic, determination and attitude catches on in that organization, the other teams had better keep looking over their shoulders.